The Zondervan Biblical and Theological Lectures series provides a unique audio learning experience. Unlike a traditional audiobook's direct narration of a book's text, Galatians 4:6: Audio Lectures includes high-quality live recordings of college-level lectures that cover the important points from each subject as well as relevant material from other sources. 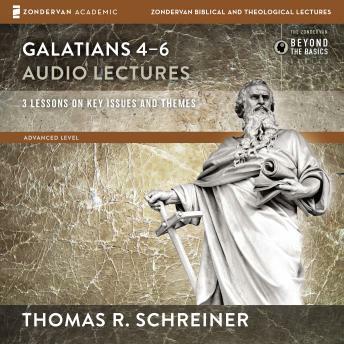 Galatians 4-6: Audio Lectures features top New Testament scholar Thomas R. Schreiner teaching through Galatians 4-6 in these engaging and challenging lessons. Based on Schreiner's Galatians commentary in the Zondervan Exegetical Commentary on the New Testament series, these lessons help bring the meaning of one of Paul's great letters into the twenty-first century. As he works his way through Galatians 4-6 passage-by-passage, Schreiner enables listeners to better understand the literary elements of Galatians, comprehend the author's revolutionary goals, and ultimately discover the book's vital claims upon the church today. Galatians 4-6: Audio Lectures is part of the Zondervan Biblical and Theological Lectures series, which is dedicated to bringing expert teaching from world's best biblical scholars and theologians directly to interested learners. These audio lectures offer the chance to learn about one of the Bible's most important books from one of today's premier New Testament scholars.